Late July, 2012 – Right on the heels of our wonderful Bittersweet Guitars factory tour came the Hamilton, MT, Farmer’s Market. 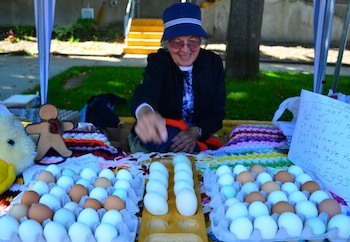 Nita was selling her colorful eggs from her many egg-laying birds: turkey, duck and goose eggs were mixed in among chicken eggs, and her carefully hand-written sign explained that if you got a bad egg she would happily replace it with a good one. Nita was a fun old gal to chat with, but the real belle of the ball that morning was a little girl not quite two years old. 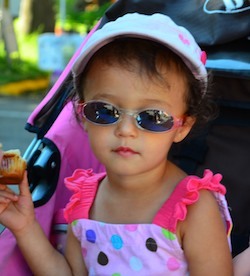 She already had the looks and style of a high fashion model. 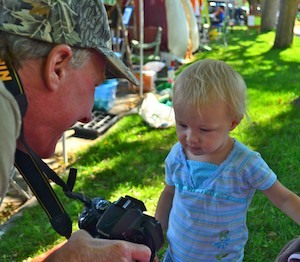 Mark enjoyed hanging out with the two-year-old set for a while, and little Savannah loved making faces and then looking at her picture in the back of his camera. This market is a family affair and the whole place was filled with kids. What fun. From Hamilton we made our way to Darby where we found the Pioneer Memorial Library filled with treasures from bygone days. Ned was our tour guide there, and he pointed out an axe cover that his granddad had made from an old cowboy boot and a scale used for weighing buffalo. 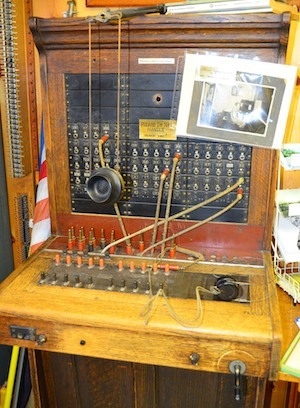 Most intriguing was the telephone switchboard. Ned’s mom had been a switchboard operator on a unit just like the one on display. I’d only seen these things in the movies and was surprised at how small it was – room for just one person. There were Missoula phone books from the 1920’s and 30’s on display too. Almost every family listed in the phone book was at an address given vaguely as “ranch N of Darby” or “ranch S of Hamilton.” No street names! 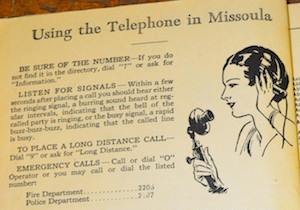 The phone book also touted the ease of using the telephone, saying how friends and family were “right beside you.” It explained in detail the sound and purpose of the busy signal. Reading that and thinking about my project of migrating our website to WordPress, integrating it with “social media,” and wanting it to look good on a smartphone made me laugh. What would the people of those days have thought (as they read their little phone books telling them that the sound of a ringing bell in their ear-piece meant the phone was ringing at the other party’s house) if you had told them what was to come? Of course many of them are with us today, romping around on the internet with joyful abandon. 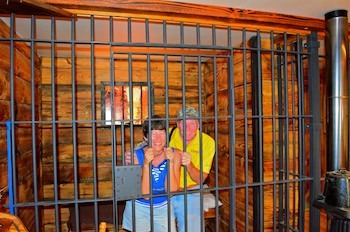 The Sherriff in Darby is a history buff, and he oversaw the renovation of part of his offices to replicate an old-time Sherriff’s office and jail. Mark and I jumped behind bars for a quick pic. 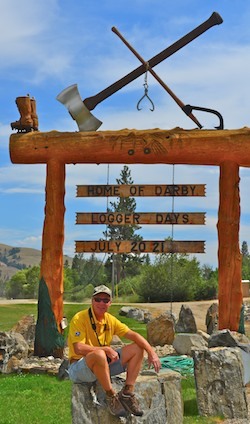 Darby is well-known for their Logger Days festival in July, and the preparations were in full-swing. Rows of log towers had gone up for the log climbing competition, and a pool was being filled with water for the log rolling competition. We missed the actual events, but folks in town kept asking us, “Have you seen the library?” This seemed like something we definitely shouldn’t miss, and sure enough, when we stepped inside we were really surprised. 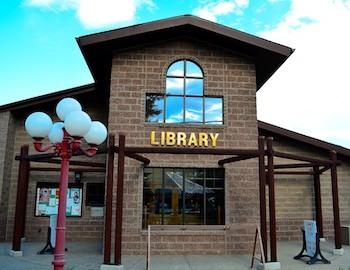 For a town with a population of less than 750, the little library would do a much larger town proud, both for its construction and for what it says about the community. 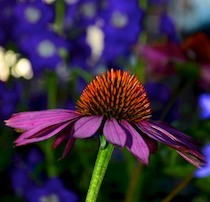 Lots of people retire to the Darby area from scientific careers launched with PhD’s years ago (GlaxoSmithKline and NIH have large research facilities in the area), and grant writing and philanthropic giving are second nature to them. At the same time, one of the challenges facing the local logging industry is the plethora of small-diamater timber that is clogging the woods. Winning a grant from the National Forest Service and its Madison, WI, forest products lab (along with other grants and gifts), Darby built a library that is uniquely engineered and is the first of its kind, showcasing a clever construction technique that takes advantage of under-utilized small-diameter timber. 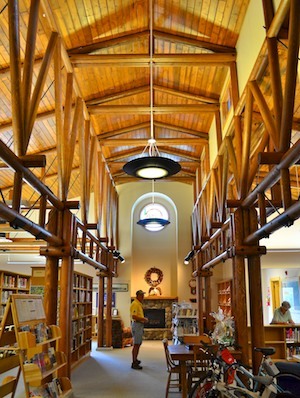 Rather than using single fat logs, the posts and beams in this library are made with groups of four skinny poles, and the visual effect (and physical soundness) is terrific. 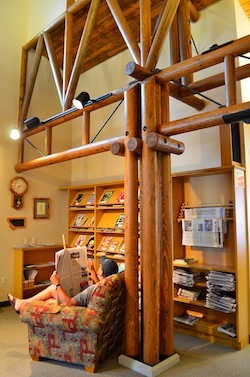 Groups of tourists from all over the world have come to admire the construction of what the locals affectionately call the “Sistine Chapel of Small-Diameter Round Wood.” What a beautiful, sun-filled space this special library is for a quiet morning of reading or computer work. The Bitterroot Valley is also a popular thoroughfare for cyclists on long-distance adventures. 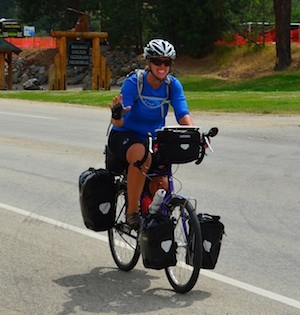 We saw dozens of cyclists loaded down with panniers. 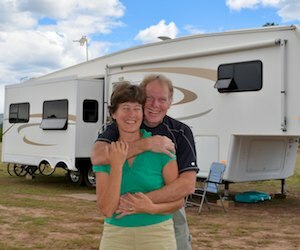 Mary and Kurt McDaniel had spent the last 7 weeks riding from Oklahoma, and they were on their way to San Francisco by way of Canada’s Jasper National Park. These cycling travelers often group and re-group with each other on the road, and a young fellow from Korea had joined the for a leg of his travels that were taking him from Atlanta to California. Wow. We had no idea that the NFS rented out cabins! 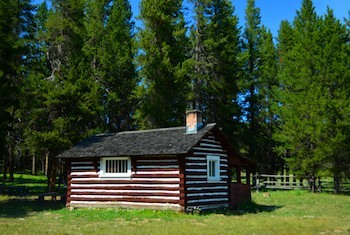 This was an old ranger’s cabin and inside was a wonderful pot-bellied stove and bunk beds. 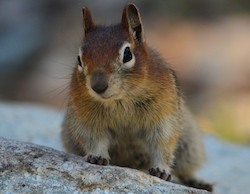 We sat outside with our newfound friends and enjoyed the late afternoon sun. It was as if they’d invited us to stop by and visit them at their own personal mountain retreat. From the south end of the Bitterroot Valley we headed on towards Big Hole, Montana, where we found life-giving hot springs and gorgeous camping.